Newsletters are also a great way to establish regular contact with customers. The same helpful information and useful tips that prospects appreciate are also valued by customers. In addition, the newsletter reminds customers about your company or organization and provides a way to announce coming events, activities or new products and services. • Relationship newsletters are published for members of an organization (such as a club, a church or an alumni association) or for employees. Typically sent free of charge, they focus on the shared interests of the group. • Expert newsletters are written on a specific topic and offered by subscription to those interested in the topic. The content of each type of newsletters differs. Since a marketing newsletter is aimed at prospects and customers, it contains information of interest to businesses – explanations, tips and tricks, “how-to” articles, relevant industry trends, product and service information that translates features into benefits and answers the question, “What’s in it for me?. Marketing newsletters may also contain coupons, special offers and a call to action. Some mention company milestones (such as a significant business anniversary or an achievement award) but rarely include personal information about individuals who work for the company. company or organization goals and plans, local, state or national business developments that have a bearing on the company or organization, community involvement; department or division news, financial results, career or job opportunities, benefits and other HR topics; staff changes and promotions, employee milestones (birthdays, marriages, anniversaries, births). E-mail newsletters can be inexpensively produced in full color and distributed at a fraction of the cost of a printed version – though they can also be blocked as spam or easily deleted without being opened. E-mail newsletters can also be configured to capture reader metrics: how many people have read the newsletter and who they are; which articles got the most hits, who clicked on links, who forwarded information. Past issues with key word search capability can be easily archived on a web site for instant access. Printed newsletters offer portability – they can be read anywhere and don’t require a computer. Someone who doesn’t have time to read a printed newsletter when it arrives can set it aside to be read later in the day or even at home. A printed newsletter better accommodates long articles or articles that contain a lot of information. And unlike an e-mail newsletter whose display is a function of the recipient’s e-mail program, a printed newsletter looks the same to everyone – color palette, typefaces and graphics. 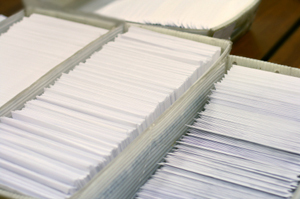 Assembling a mailing list for a printed newsletter is an easier task than assembling an e-mail list, particularly if you want to include prospects. Whereas it is easy to obtain a mailing list of prospects that conform to a set of demographics, it is much harder to obtain comparable e-mail addresses. By convention, e-mail is considered permission-based marketing, meaning you must have the consent of the recipient to send the newsletter. A printed newsletter does not have this restriction. Post PDFs of past issues of the print newsletter on the web site for your company or organization, and include a way to sign up for both the printed and e-mail version of the newsletter. When you use the power of both e-mail and print newsletters together, you’ll be doubling up on one of the most powerful ways to build a relationship with your customers and prospects. If you want to begin using this powerful marketing tool for your company or organization, call Alex Davis or Bret Atwood at (804) 226-1500. We have many years of experience and can help you launch an effective newsletter. • Interview an expert: Find someone within your company or from the outside to provide an expert opinion on a topic of interest. • Use guest articles: Ask an expert in a complementary field to write an article. • Share your knowledge in “how-to” articles: Write about topics that will help other succeed in using your company’s products or services. • Generate a numbered list: Everyone loves a numbered list. Use any number you want, from small to large. • Answer reader questions: Invite readers to submit questions or topics of interest. • Simplify a technical issue: Explain a technical topic in simpler terms so it is easily understood by the reader. • Case study: describe a customer problem and show how your product or service solved the problem. • Community service: Describe a community project or donation made by the company or organization and its staff and members. • Employee profile: Provide information about an employee that shows why he or she is outstanding in their job performance.